Value at risk: how much money could I lose? In investments, the main threat is a negative change in prices. Suddenly, the price trend turns down and you do not check regularly your portfolio. After some weeks, you discover that your portfolio devaluated. How could I have prevented it? Of course, you could maybe follow more often the markets or delegate in an advisor. The third option is having the right information and figures to preview possible losses if you do not trade in the markets often and take decisions from them. “My portfolio” has an -8,17% VaR. What does it mean? VaR is a statistical measure. 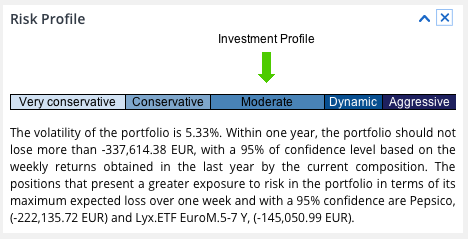 In this case, the information that you get from it is: you can lose more than an 8,17% in a year with a probability of 5% for this portfolio if you do not trade in this period. Reading it on the opposite: there is a probability of 95% that you could lose at the most an 8,17% in a year. In T-Advisor you can also compare your portfolio VaR with the smart benchmark (read our previous post) and the markets in which you invested. For instance, the risk of this portfolio is less than the indexes where we have some investments. Moreover, you can obtain this figure as a proportion (above) or in absolute figures (below) linked with the volatility. But what if I had an undiversified portfolio? How to find out the risk of diversifying against not doing it? T-Advisor shows you this comparison both as a proportion and in absolute terms. You can also obtain the earnings if you diversify your positions. Risk is the great foe for investors. Nobody wants to lose money in the markets, but sometimes it happens, because markets are volatile (read more in our post about it). VaR is an intuitive figure, easy to understand, and provides an immediate picture of the money that we are risking for a combination of different stocks or assets, not just one. Such figure lets us react and change our positions to prevent losses if we consider that we are playing hard. This entry was posted in T-Advisorpedia and tagged Diversification, loss, risk, VaR on January 20, 2014 by Oscar Garcia.